Music Thing: Can you identify this strange inside-out steel drum? 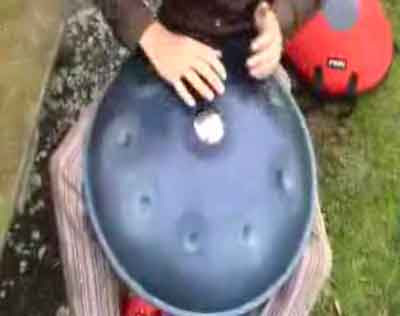 Can you identify this strange inside-out steel drum? dammit, I was gonna say that. played with one at a hippy like festival. they are [apparently] hollow designed and built like a steel drum. i suspect that there is a cunning use of computer design and accurate steel pressing involved at some point. lovely and i seem to remember expensive. It would seem that buying a Hang has now become something of a pilgrimage or spiritual quest - and I know for a fact that they consider the proliferation of the Hang to be something that requires a sensitivity and openess among those who seek to have one and an obvious determination!! New price is around £450/$900. Second hand market is strongly contested - expect to pay $1500-2000 for a second-hand instrument - Euro 1500-2000 in Europe. They very occassionally come up on E-Bay but its a rare event. There's probably been around 5 or 6 in the last year or so. The best I can say is, keep the faith, write your letter/fax and hope for the best (oh and save lots of money to afford the trip over). SO there you go. A pretty exclusive club. I saw one of these in Australia being played by a busker, really cool. Saw a hippy bloke playing one in Barcelona, had everybody (tourists) entranced. Very floaty and ambient. Sounded to me like it was all in one scale, so no chance of hitting a bum note! check out the band Portico Quartet. They are based in London, and play on the south bank under the NFT every saturday. They have two hang players, a wicked double bassist and Soprano sax to top things off. Awesome live, and don't lose much on record. Now, where have I seen one of those before? I saw a guy in Barcelona with one too, up in the old town. I took some footage at the time I was so impressed by the sound. They are at least 2 hang players in Barcelona, one use to act at the old town, and another one uses to be at the Park Guell in the week end morning. Is impressive, but a bit monotone once you have heard the instrument some times. Its still a very new instrument and the style has to be developed over time. Yes my partner and I saw the hang player at Parc Guell in Barcelona. Nice instrument - we bought his CD and made a little movie on our camera. Very soothing. Guys, it's the top of a charcoal grill. There we go again, Lomo pt 2: music instruments. The Hang is a truly amazing thing! I had a chance to play one a few months ago at a festival, but had no idea what a special instrument I was playing until I got home and looked it up on the net. Very, very hypnotic and absorbing to play on. I'd love one but I'd have to sell my kidneys on Ebay to be able to afford it. Oh well, such is life. Well, I saw two hippies playing this instrument in central Amsterdam in the end of august. I was also really impressed by the sound. On www.hangforum.com you could find other hangplayers.